This topic describes how to add Tizen privileges and PPAPI permissions to a Native Client project in the Tizen Studio, and lists the Tizen privileges corresponding to PPAPI permissions. The partner level privileges require at least a partner-signed certificate, which is granted to developers who have a business relationship with the vendor. For more information about Tizen privileges, see Security and API Privileges and Tizen Privilege. In Tizen applications, Native Client (NaCl) modules using security-sensitive PPAPI interfaces must also declare permissions in its ".nmf" manifest file. Some PPAPI permissions correspond to Tizen privileges, since they grant access to the same resources. Consequently, both the PPAPI permissions and the corresponding Tizen privileges must be declared. When you build a NaCl project in the Tizen Studio, the "config.xml" and "<projectname>.nmf" configuration files are generated automatically. The Tizen Studio detects and adds privileges based on the included interface headers in the source code. It maps the privileges to PPAPI permissions, and includes them in the generated "<projectname>.nmf" configuration file. However, privileges required by header files outside the project must be added separately. 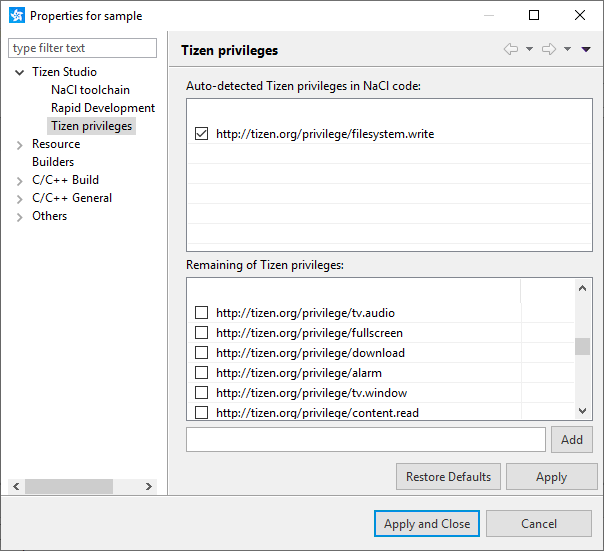 When you add Tizen privileges to the project in the Tizen Studio, the equivalent PPAPI permissions are automatically added to the "<projectname>.nmf" configuration file. Be careful when modifying the "config.xml" and "<projectname>.nmf" files directly. In the "Project Explorer" view, right-click the project name, and select "Properties". In the side menu, select "Tizen Studio > Tizen privileges". Select the desired privileges from the list, and click "Apply". To close the dialog, click "Apply and Close". To verify that the PPAPI permissions were added, open the "CurrentBin/<projectname>.nmf" file. The following table maps PPAPI permissions to the Tizen privileges that must be added in the Tizen Studio. The PPAPI permission name is the same as the interface using it. Interfaces that do not require permissions are not listed. If a PPAPI permission corresponds to more than 1 Tizen privilege, you must add all the corresponding privileges. The following table lists other application features that require Tizen privileges. The listed privileges are supported since Tizen 2.2.1.